Do not miss the 3 weeks chance to buy Digi-egg evolution package! You can expand the Digimon archive by 10 more slots. 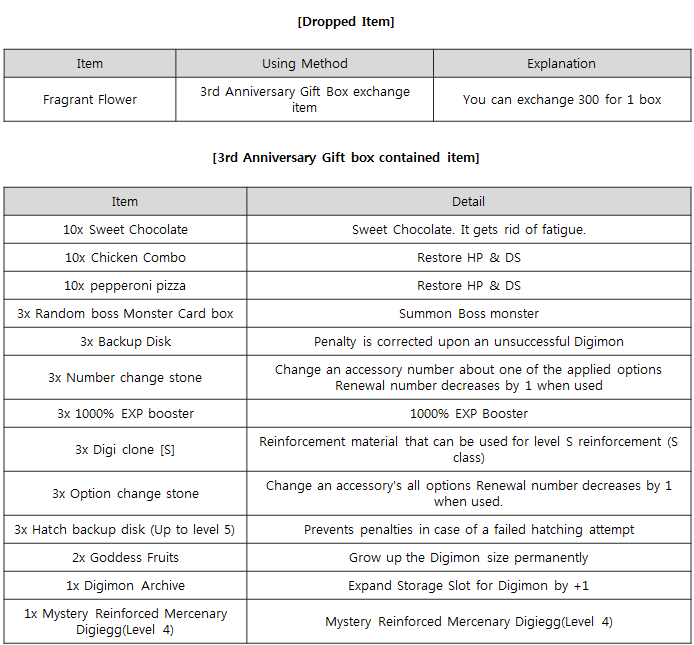 You can expand the Digimon archive up to 90 slots with the Digimon archive expansion items. 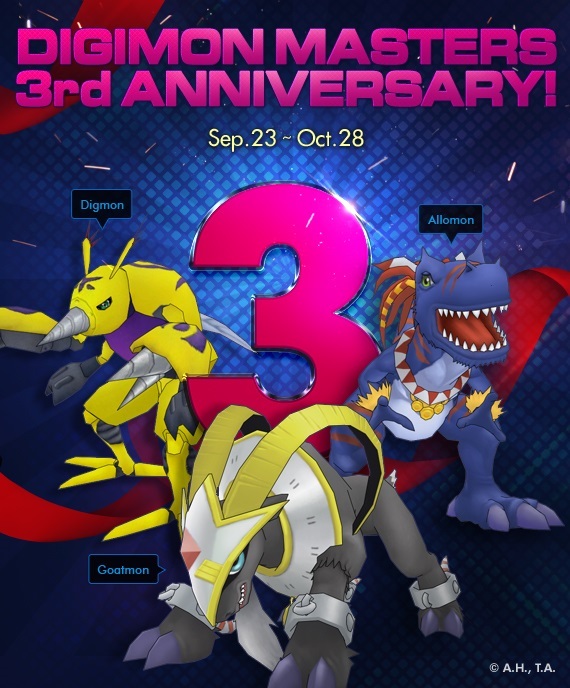 To celebrate Digimon Masters’ 3rd Anniversary, Dats Center will give various gifts depending on the game connecting time. Event items cannot be traded. You can randomly obtain a Firework item from 5 types of Firework items for the in game. 1 piece of 3rd Anniversary avatar coin can be obtained after 3 hours of continuous game play every Saturday during the event period. Avatar items can be obtained based on the number of 3rd Avatar coins. 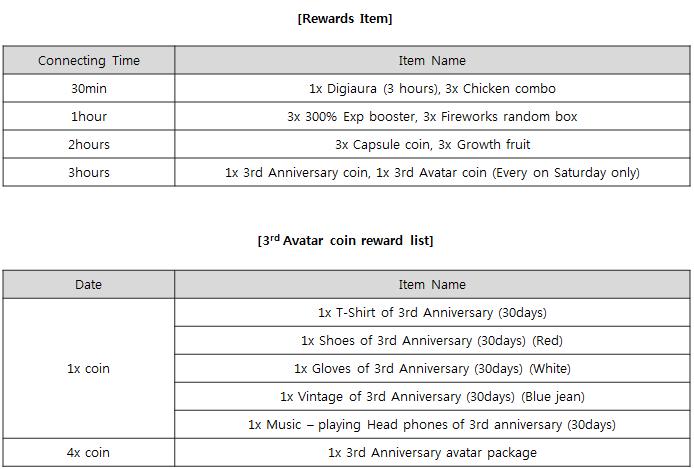 1) 1 piece of the avatar from Anniversary avatars in the list can be obtained using 1 Avatar coins. 2) 1 piece of avatar package box can be obtained using 4 Avatar coins. Please find the NPC ‘Frigimon’ to exchange 3rd Avatar coins for prizes. A Fragrant flower will drop when you hunt an enemy Digimon. You can exchange the flower for a 3rd Anniversary Gift Box. Users who exchange many fragrant flowers will receive many gifts. You can trade the fragrant flowers among users. You can exchange 300 fragrant flowers for one 3rd Anniversary Gift Box. 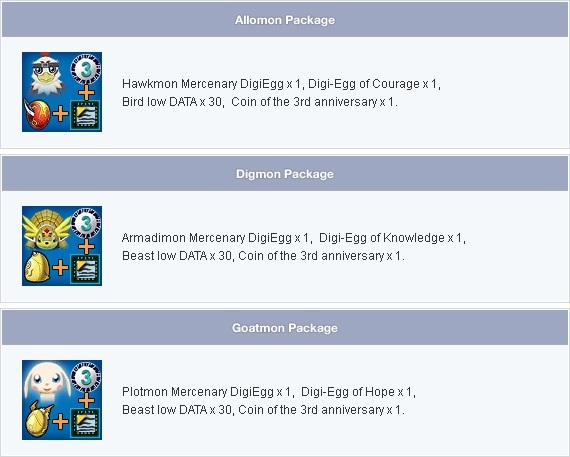 You can obtain various popular Digimons such as Lucemon, Xuanwomon, Qinglongmon, Zhuqiaomon, Baihumon, Kudamon, Agumon (black) with the Level 5 expansion Mercenary DigiEggs. Users who exchanged the fragrant flower during the event (users who participated in the event) and change the name of their Tamer will be disqualified from the drawing. 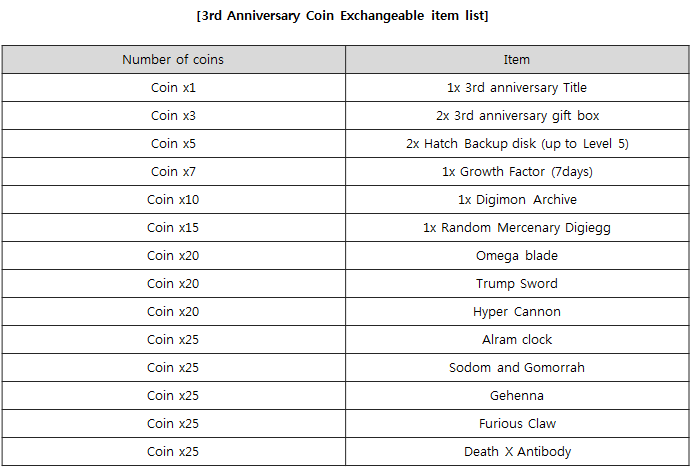 You can exchange the 3rd Anniversary commemoration coin for LaLamon at the Dart Center. The winners for each number of exchanges of the gift event will be notified separately after the 3rd Anniversary event is over. Use the Firework item (3rd Anniversary event item), then take a screenshot with your friends while using the item, and upload the screenshot together with a message for the Digimon GMs on our Facebook event section to have a chance to be selected as one of the 30 users per each server and receive a Tamer Exchange Ticket (Tai/Mimi/Matt/T.K). -        All tamers can only win once. -        Upload your screenshot with a message to GM on Facebook event page. -        Participants should comment their ‘Tamer name/Server name/Wish item name (Among Tai, mimi, Matt, TK). -        Please comment your friend’s information If you have a friend who took a screenshot. -        Participants must not use the tamer change item during the event period to qualify for this event. -        Event period: 9/23 ~ 10/28. Winners’ list will be posted after the event period. Enjoy the battle without any fear of penalties! There are no battle penalties (Tamer EXP 3%, Digimon EXP 1%) even when you die during the event. The GM gift is given to you for visiting Digital World for the first time. The beginner sets are identical to items sold in the in game cash shop. You can play a mini card game at the Dats Center with ChaosPiedmon NPC. Tamers must pay 10M game money and win an item by fighting Chaos Piedmon. Open the cards in the order shown by Chaos Piedmon and you will receive the item on the last card you open. 3 play’s per day per Tamer during the event. During the event, Movement Speed increases by 30%. You can obtain additional EXP 200% in the weekdays, EXP 300% in the weekends, and EXP 500% in the weekend peak times. All Digi-egg evolution digimons' stats increase like above during the event. After the event ends, all the stats will be restored to the default setting. This page was last modified on 28 October 2014, at 10:58.